Size of this PNG preview of this SVG file: 270 × 240 pixels. Other resolutions: 540 × 480 pixels | 675 × 600 pixels | 864 × 768 pixels | 1,152 × 1,024 pixels. Deutsch: Rosa Winkel. Gezeichnet von Fibonacci. 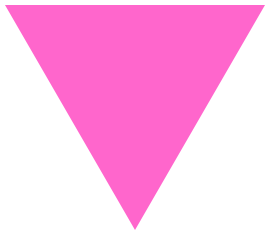 English: Pink triangle. Created by Fibonacci. Español: Triángulo rosado. Creado por Fibonacci. Srpskohrvatski / српскохрватски: Ružičasti trougao. Napravio Fibonacci. current 05:20, 24 February 2006 270 × 240 (317 bytes) Fibonacci Simplified.